Like the debut albums from quite a few seventies rock bands (Alice Cooper and Nazareth spring to mind), this is a comparatively undercooked, somewhat directionless first offering from a band who went on to be one the decade's most powerful, energising rock bands. 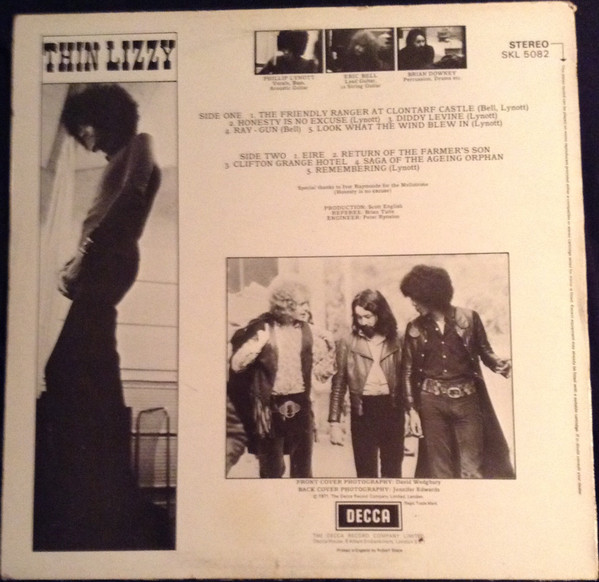 It is actually quite folky and acoustic in many places, probably taking its cue from the country rock genre and Led Zeppelin III and there is precious little trademark Thin Lizzy rock to be found on it. That said, I have always quite liked the album and it does have some hidden depths, just don't expect any "Boys Are Back In Town"-style material. There is, though, a winsome Celtic folkiness to it and Phil Lynott's deceptively sensitive and poetic lyrics are beginning to take shape. Surprisingly, considering its Irishness, the album was recorded in London. The intriguingly titled "The Friendly Ranger At Clontarf Castle" is a funky, soulful opener with a great sound quality to it. It has great percussion and wah-wah guitar. Personally, I think this is an unusual, underrated track, despite it not quite reaching its full potential. 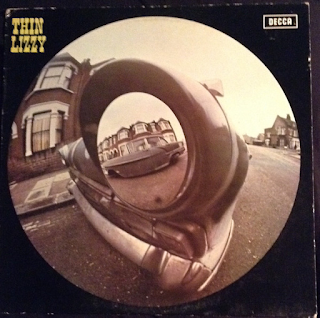 "Honesty Is No Excuse" is an acoustic and bass ballad that sounds nothing like Thin Lizzy as the world would come to know them, but again, it breaks out into some interesting, melodic rock passages. Many commentators have criticised this album for being all over the place, and I sort of understand that, but I also feel there is more to it than meets the eye. I really feel it is quite underrated. "Diddy Levine" is the first example of those extended narrative Celtic-style legend songs that Phil Lynott would come to write quite a lot. It has some beguiling percussion, drums and bass on it, with impressive guitar too. It is very early seventies in its rambling proggy, psychedelic-ish style, but again, I can't help but like it and reiterate once more how great the sound is on this latest remaster. For those who think there is no rock on the album, however, there is a few minutes of Hendrix-influenced stuff with "Ray-Gun". This is very much a track of the early seventies, again, as indeed is "Look What The Wind Blew In", probably the rockiest number on the album. "Eire" is a haunting, obviously Celtic-influenced slow tempo folk rock number. "Return Of The Farmer's Son" also rocks quite a bit, in an early seventies, guitar-driven sort of way, featuring some pretty searing guitar and a strong, dominating vocal from Lynott. "Clifton Grange Hotel" is a song with potential that ends a bit too soon, while "Saga of The Ageing Orphan", even on this first album, is an example of the sort of tender song Lynott would come up with over the next two or three albums. "Remembering Part 1" closes the original album with a rambling piece of guitar-driven doodling that is pretty directionless, but also quite enjoyable, as indeed all of this album has been. Yes, it is full of rough edges and a feeling that there is better to come, but taken for what it is, it is not a bad first offering.